Run by Robin Pope Safaris, this remote tented camp lies within the Nsefu Sector of the National Park and enjoys a stunning location on a wide bend of the Luangwa River, perfect for sundowners. A grove of mahogany trees shade the large custom-made tents and open air bathrooms. From the large canvas covered lounge and bar, guests can watch the elephants, hippo and antelope on the river banks. There is a large wooden deck often used to serve meals overlooking a lagoon, Buca Buca, where a whole morning can be spent quietly sitting while the game comes down to feed and drink. Being remote and so small, guests here have these views to themselves. A maximum of 10 guests are accommodated in large en-suite rooms. Open: Tena Tena is open from 22nd May to 31st October. It is owned by Robin Pope Safaris (RPS). 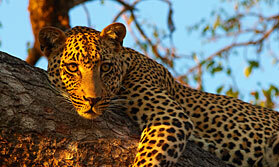 Location: The camp is in the Nsefu Sector of South Luangwa National Park. It is about a 75 minute drive from Mfuwe airport. It is a few hours' drive north of RPS's main camp, Nkwali, and close to another RPS bushcamp, Nsefu. Rooms: There are 6 guest tents, comprising 4 twins which can also be configured as doubles, and 2 doubles, one of which is more secluded and makes good honeymoon accommodation. All have private decks overlooking the Luangwa River, and en-suite bathrooms, screened for privacy and open to the sky, with a shower with hot and cold water, twin hand basins and a flush toilet. Rooms are equipped with drinking water, mosquito repellent, torches, safes and charging points. Activities: Tena Tena offers game drives, night drives, walking safaris, visits to the local village and market and to Tribal Textiles, a group of local artists who design and produce hand crafted textiles. Facilities: The main area is spread over 2 levels, with a lounge, bar and dining area on the upper level and another sitting area below. This is a bushcamp and has no TVs or radios. The camp is run on solar power and there is a back-up generator. Tap water is from a borehole and is safe for drinking, though complimentary bottled water is also provided. There is a free laundry service. Dining: Meals (breakfast, brunch and dinner) are eaten communally, by the campfire or at the dining table, often al fresco. Soft drinks, house wines and local spirits are included, with other drinks (Champagne, imported spirits, wines and liqueurs) payable locally. Children: Children aged 12 years and over are welcome, though there are no special activities for children. Communication: There is no Wi-Fi internet access or mobile coverage. Tena Tena is in radio contact with the main camp, Nkwail. Notes: The camp accepts cash only, in Zambian Kwacha, US Dollars, Euros and Sterling. "Magical-it casts its spell from the minute you arrive, a combination of wonderful location, camp and staff. We didn't want to leave and now we want to go back!" "Tena Tena has a reputation for being one of Africa's best safari camps - but in recent years there have been a few strong contendors! The location of Tena Tena is lovely but I felt it strange that the rooms opened up onto the 'back' of the camp, not the river front and also that the camp has a fence round it. I understand the thinking behind it, but for me it spoils the whole experience of being 'in the bush'. I works well as the start or end of a walking safari." "The design of the individual buildings/tents was really unusual with tree trunks sawn & upholstered to individual shapes. I enjoyed washing & showering as I could look out over the drying river bed towards the river itself. Meals delicious." "Slightly dark Not such a good view from the tent but excellent food and service"